Byzantine ethical writer of the thirteenth or fourteenth century. Of his life no details are known, except that he was the author of an ethical work entitled "Sefer ha-Yashar," which was confused with Jacob Tam's halakic work of the same name and erroneously attributed to the renowned tosafist. This error was detected by Menahem of Lonzano, who, in his poem "Derek Ḥayyim" ("Shete Yadot," p. 122), expressly states that the ethical work in question belonged to Zerahiah. Lonzano did not succeed, however, in correctly establishing the identity of its author, for a second error immediately arose. 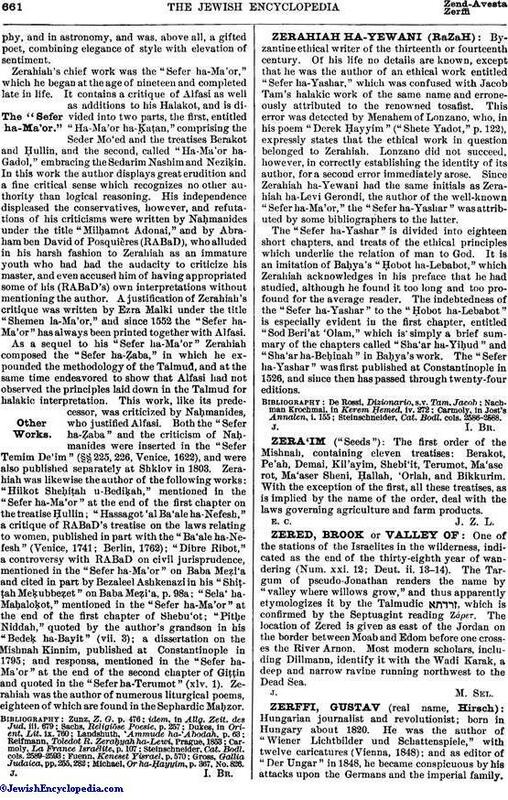 Since Zerahiah ha-Yewani had the same initials as Zerahiah ha-Levi Gerondi, the author of the well-known "Sefer ha-Ma'or," the "Sefer ha-Yashar" was attributed by some bibliographers to the latter. The "Sefer ha-Yashar" is divided into eighteen short chapters, and treats of the ethical principles which underlie the relation of man to God. It is an imitation of Baḥya's "Ḥobot ha-Lebabot," which Zerahiah acknowledges in his preface that he had studied, although he found it too long and too profound for the average reader. The indebtedness of the "Sefer ha-Yashar" to the "Ḥobot ha-Lebabot" is especially evident in the first chapter, entitled "Sod Beri'at 'Olam," which is simply a brief summary of the chapters called "Sha'ar ha-Yiḥud" and "Sha'ar ha-Beḥinah" in Baḥya's work. The "Sefer ha-Yashar" was first published at Constantinople in 1526, and since then has passed through twenty-four editions. Steinschneider, Cat. Bodl. cols. 2586-2588.